The program starts in Medan from your hotel. We can also fetch you from Kuala Namu airport with an early morning flight. From Singapore or Kuala Lumpur it is a one hour flight to Medan. This day you will see the orang utans in their natural environment and get information from your guide about the fauna and flora of Gunung Leuser National Park. Permit and entrance fees are included in this tour. 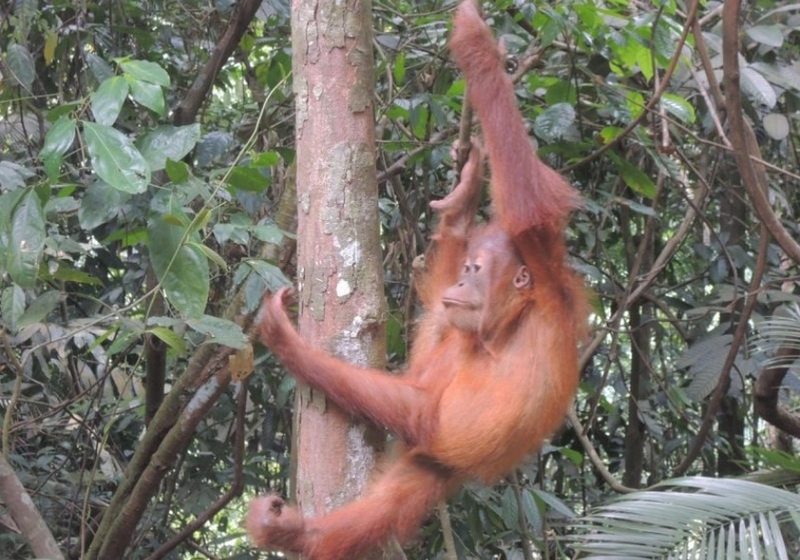 See the orangutans in their natural environment in the jungle. The program starts in Medan from your hotel. We can also fetch you from Kuala Namu airport with an early morning flight. From Singapore or Kuala Lumpur, it is a one hour flight to Medan. This day you will see the orangutans in their natural environment and get information from your guide about the fauna and flora of Gunung Leuser National Park. Permit and entrance fees are included in this tour. Daily departure. Bring an extra t-shirt and towel and mosquito repellent. Departure at 8 in the morning returns to Medan at 19.00 pm. Please give us your address in Medan for our pick up service. – Permit and local guide to see the orangutans in Bohorok/Bukit Lawang and 3 hours jungle trip with a guide.